What is inside your cosmetics? To lessen the toxic burden on your body and to decrease the likelihood of development of chemical sensitivity or allergens it is best to use safe and natural hair products and other cosmetics. 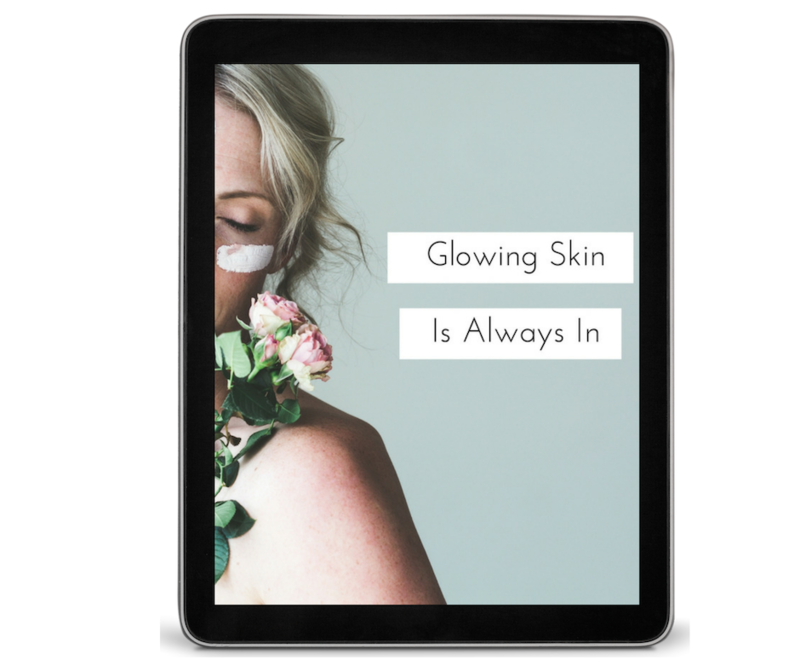 Get Dr. Ellie’s Glowing Skin Guide Here for FREE! The cosmetic industry is a multi-billion dollar industry, predicted to have reached $265 billion in 2017. Cosmetics include anything that is prepared to be in contact with the body or teeth such as toothpaste, make-up, and even hair products. With the average adult using about nine cosmetic products a day, it is really important to make sure the ingredients in those products are safe, allergen-free, and non-toxic. With the demand for new products and the economic benefit for companies, manufacturers are trying to produce a high-quality product but at a low cost and now in most cases also be environmentally friendly. In this development of new products, the safety of the product ingredients has come into question. The FDA has banned nine ingredients from cosmetics. The list included: bithionol, chlorofluorocarbon, chloroform, halogenated salicylanilides, hexachlorophene, mercury, cattle materials, vinyl chloride, zirconium-containing complexes. Cosmetics can include fragrances, preservatives, surfactants, antioxidants, emulsifiers, hair dyes, polish, and other components to promote longer shelf life and add appeal to consumers. These additive chemicals can often be hazardous, toxic, promote endocrine disruption, and some have been identified as carcinogenic. Check out our previous article on endocrine disruptors here. Heavy metals can appear in products as a part of the manufacturing process or by the breakdown of other ingredients in the product. Common heavy metals found are mercury, arsenic, cadmium, lead, and thallium. For example, Canada has banned most heavy metals from being in cosmetics (Zulaikha, 2015). Heavy metals are also added to make-up and eyeshadows to get the metallic shiny effect. But it is just not the toxicity of heavy metals that is a concern, it is also may have an allergic component. Many people also have an allergy to metals such as Nickel, Cobalt, and Chromium, which causes further irritation and disruption in the body. To preserve the shelf life and stability of the products preservatives are commonly added. They also serve the purpose of keeping the product clean and can help to prevent contamination. Common preservatives added are paraben, its derivatives as well as phthalates, and formaldehyde. You will commonly find paraben in cream-based products. Formaldehyde is another common preservative used in shampoos. Formaldehyde is probably the most well known toxic chemicals, used in embalming fluid. (So, why do you want it in your cosmetics?!). Because of this, some companies have switched to not using formaldehyde directly but using formaldehyde byproducts because it does have an effective anti-microbial property to keep the product clean. What about paraben, is it safe? The short answer is no, not really. There is some evidence that paraben has been found in breast cancer and may elicit estrogen-like properties. Phthalates, on the other hand, has been linked to many health issues including liver and kidney toxicity and poor reproductive health (Jadhav, 2016). Fragrances are commonly added to products to mask the smell of raw materials used to make the product and to enhance customer draw to the products. But with more and more people becoming sensitive to chemicals, the addition of fragrances can be harmful to not just the person using the product but others around. Fragrances actually account for 30-45% of all allergic reactions to cosmetics (Zulaikha, 2015). Common fragrances are limonene, hexylcinnamal, linalool, and butylphenylmethylpropional. Linalool and Limonene are often found in shampoo, shower gels, and lotions. Linalool is a naturally occurring terpene and pure form is not allergic in nature. Limonene is known to be one of the most inexpensive fragrance materials and is very sensitive to oxidization in the air and can chemically change to an allergic compound during shipping. What type of reactions can occur? 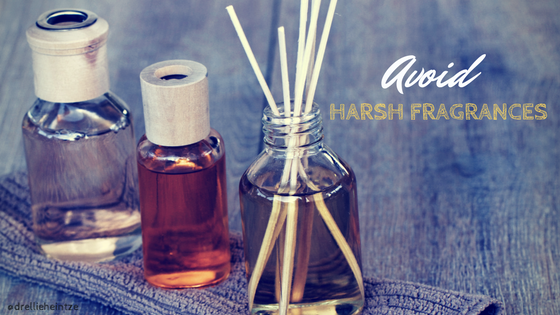 Fragrances can lead to allergic reactions such as dermatitis, skin sensitivity, and migraines. Just like in applying products to the skin and being absorbed into the skin and bloodstream, fragrances can act in the same way thus going into the blood and potentially causing toxicity or damage to organs. Just like with fragrances, preservatives can also cause contact dermatitis that leads to swelling of the skin, itching, and redness. To lessen the toxic burden on your body and to decrease the likelihood of development of chemical sensitivity or allergens it is best to use safe cosmetics and other natural hair care products. Ideally, products that state their “no list” and are more about promoting health than cheaply made products. Look for brands that use essential oils, are gluten-free, contain no harmful fragrances, colors, sulfates, DEA, parabens, ethanol, phenoxyethanol, or petrochemicals. Want that healthy skin glow, naturally? Get our FREE guide here! To schedule a consult with the doctor to discuss your skin goals and concerns, please call our office at (425) 686-4498. Jadhav, V. e. (2016). Cosmetic Side Effects. World Journal of Pharmacy and Pharmaceutical Sciences , 6 (1), 327-343. Zulaikha, S. e. (2015). Hazardous Ingredients in Cosmetics and Personal Care Products and Health Concern: A Review. Public Health Research , 5 (1), 7-15.